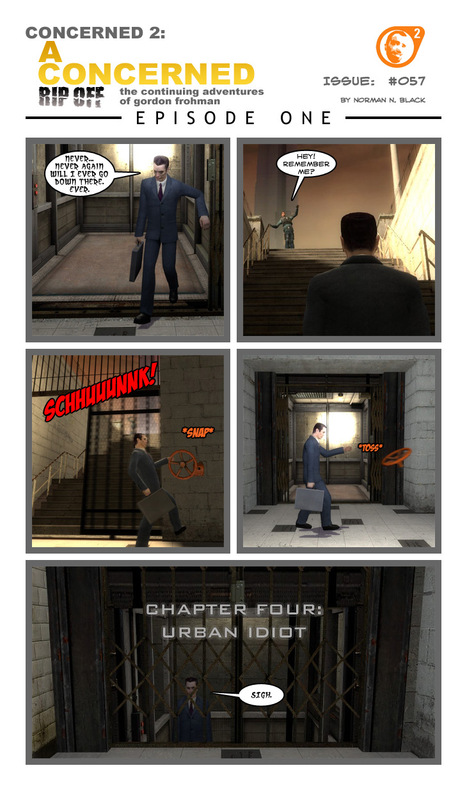 In the developer commentary from Valve, they talked about the lack ofthe G-Man in Episode 1. They claimed that after the appearance of the Vortigauntson top of the Citadel, and the actions that took place during Episode 1, thatthe G-Man somehow lost track of Gordon Freeman and was unable to find him againuntil Episode 2. My version is that he just hates the underground section ofEpisode 1 and doesn't want to follow Gordon Freeman back down there. But hewill go back down there just to escape from Frohman. that was pretty cool. I love how he throws the wheel away. Whoa! This one was really fast in developing! Also this one solve the problem why always the wheel is never at his needed place! Sigh, i really missed G-man. I love all the inside jokes. Seems like Frohman is somehow at the root of all the puzzle problems Freeman comes across.